“The Lord hath heard the prayers of his people” (Mosiah 27:14). Devon, it is time to get ready for prayer. No, Devon. You should kneel, fold your arms, and close your eyes when you pray. You should also be still. It shows respect for Heavenly Father. Devon dropped his toy truck, folded his arms, and knelt next to Mom. How does Heavenly Father listen to me? Does He have ears? Yes, He does have ears. He listens when you say your prayers. Devon said his prayer and stayed on his knees with his head bowed and arms folded for a few seconds after he had finished. He’s not talking back. Are you sure He is listening? Heavenly Father usually answers our prayers by talking to our hearts and minds rather than talking to our ears. He does this through the Holy Ghost. Devon, how do you feel when you share? And how do you feel when you do something wrong﻿—like throw your toys? The Holy Ghost helps us have these feelings to let us know right and wrong. He also helps us have ideas about what things we can do to be happier. There are other ways we can know Heavenly Father is listening. Remember how He helped Grandma feel better after she got a priesthood blessing? Yes, I’m glad Grandma felt better. Just because you do not hear Heavenly Father talking to you, that does not mean that He isn’t listening. He sends you warm, good feelings to let you know He is there. Now I know, Mom. Heavenly Father does listen to me. Devon needs to get ready to pray. Look at the pictures. If he is getting ready to pray, circle the picture. If he is doing something that does not help him get ready to pray, draw an X on the picture. Find a quiet time and place to read “He Is Listening” with your child. Share an experience about when Heavenly Father answered one of your prayers. Share how you felt. 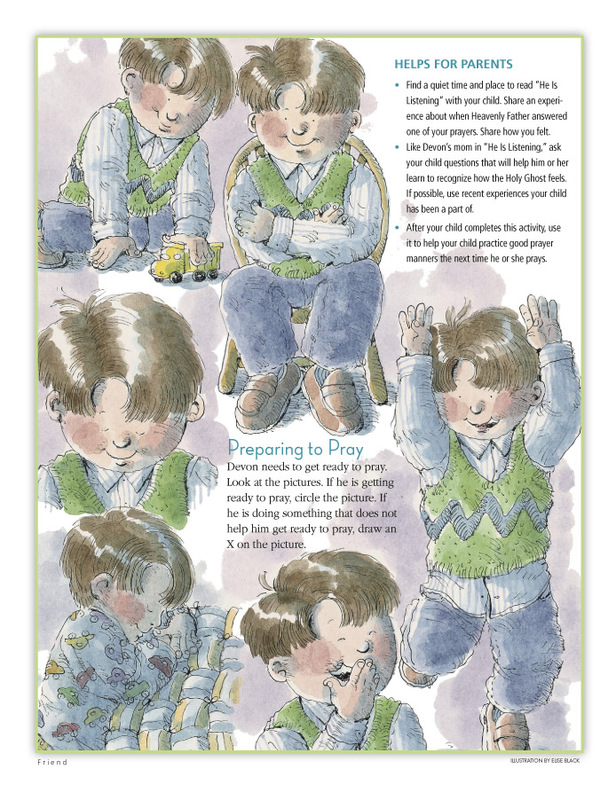 Like Devon’s mom in “He Is Listening,” ask your child questions that will help him or her learn to recognize how the Holy Ghost feels. If possible, use recent experiences your child has been a part of. After your child completes this activity, use it to help your child practice good prayer manners the next time he or she prays.